I’ve gotta be honest, I’m DYING for spring to finally spring, because after spring comes summer! The sooner the better. The idea of wearing a bathing suit does not frighten me; bring it on. The long days, summer cocktails, trashy novels read beachside, espadrilles, and best yet, all the fresh fruit and berries. Specifically, I’m craving blueberries. Yes, I know that late March is actually a little early to begin baking with blueberries—they are, technically, still “out of season” and not always ripe at the grocery store (they’re basically still non-existent at the Greenmarket). But, if you go to Whole Foods and search out the ones imported from South America (this is recourse if you simply can’t get locally-grown ones just yet), they will surely be pricey, but they’ll quell the craving and still be delicious in the muffins. 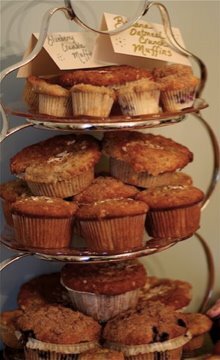 If you serve these homemade muffins to friends and family at a springtime brunch, you will be asked incessantly for this recipe. Baking these is a great way to enjoy the comfort food the still-cool weather demands, while starting to look forward to the flavors that are coming with a rise in temperatures. P.S. Don’t think about bathing suits when you’re eating these crumble-topped wonders… I mean in actuality, summer is still months away! Preheat your oven to 400 degrees and make sure your rack is in the middle position. Grease muffin cups or line with muffin liners. To create the crumb topping, combine sugar, flour, butter, and cinnamon and work with hands until large clumps form. In one bowl combine flour, sugar, salt, and baking powder. In another, the liquid ingredients. Here’s a trick…in a one cup measuring cup (or any liquid measuring cup that’s large enough to hold the amount of batches you’re making, i.e. doubling recipe make sure it can hold 2 cups, tripling the recipe make sure it can hold 3 cups) add canola oil, egg, and milk and beat together with a whisk. With the easy-pour measuring cup at your disposal, mix the wet ingredients into the dry ones and fold in blueberries carefully, do not over-stir. Fill muffin cups right to the top, and sprinkle with crumb topping mixture. Bake for 20-25 minutes.